While we are using messenger applications, we look for some certain settings. One of these settings is showing/hiding messages summary on lock screen. We have already mentioned about WhatsApp Settings on iOS devices for you before on How to Chat Online. We will mention more about all of these settings on pages at incoming days. Now we will tell you how to hide WhatsApp messages on Lock Screen of iOS devices. Please ask us if you have any question about this subject with commenting this page. Disable “Show on Lock Screen” section. 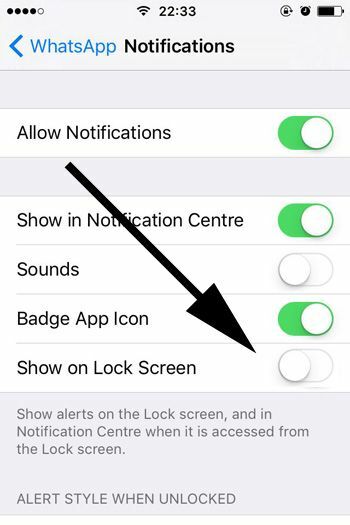 Settings > Notifications > WhatsApp > Disable Show on Lock Screen. See the picture below for settings of disabling lock screen. That’s all you have to do for hiding messages from WhatsApp lock screen. Please ensure that you haven’t disabled all your notifications. If you have any questions, you can ask us through our services. We are going to respond your requests and questions as soon as possible.